Antarvedi is the famous temple of Sri Laxmi Narasimha Swamy and this temple is built during 15th and 16th centuries A.D. This is a famous tourist destination in East Godavari District and is about 15 km from Sahinetipalli, 20km from Razole and 10km from Narsapur. It is believed that Antarvedi is the place where Maharishi Vasistha is believed to have brought the Godavari River. 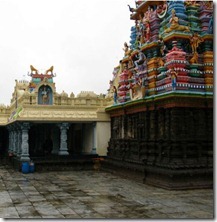 About the Temple: Antarvedi temple with five gopuram and you can find idols of Lord Vishnu, Maheshwara and other gods. Here Bheeshma Ekadasi which usually comes in the month of January is Celebrated Grandly as a fair and usually there will be a huge crowd at that moment visiting the temple and taking the blessings of God. There are good accommodation facilities in Malkapuram and also one can find Andhra Pradesh Tourist Guest houses and also Hotels are also available. Through Bus or Car: Bus servicescared car facilities are available from Kakinada, Rajahmundry and Amalapuram. Train Facilities: You can reach Antarvedi through train as there are many trains from the state that moves to Rajahmundry, Kakinada and Samalkota. After reaching this place you can travel through bus or hiring a car as per your comfort.